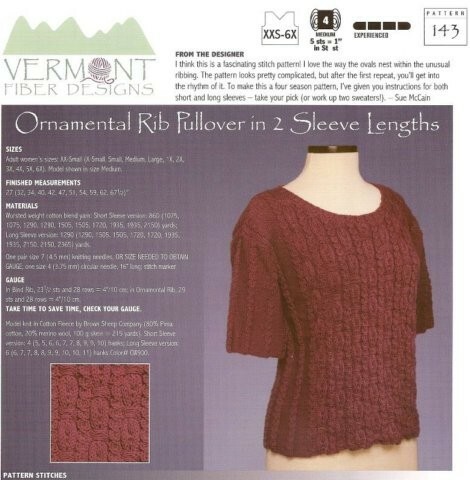 Ovals nested within the unusual twisted rib. A flattering neckline and two sleeve lengths give flexibility to a very pretty overall design. Eleven sizes from XXSmall to 6XLarge. 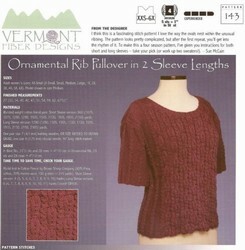 Knit in worsted weight yarn. Uses worsted weight yarn, 190-230 yds/100g. 11 sizes, XXS-6X takes between 400-1000 g short sleeved version; 600-1100g long sleeved. Finished bust sizes from 27-67.5 inches.